By now, you know that the Fewd Snobs love a variety of normal food. But did you know that we also love breakfast food? No? Now you do. You’re welcome. Herman discovered the new Pumpkin Pie Pop-Tarts by browsing a fellow food website, Brand Eating. Our friends at Brand Eating reviewed them. Check it out here. But read our review first! We didn’t read the review. We headed right to the store to get some of these, because we knew we had to review these. 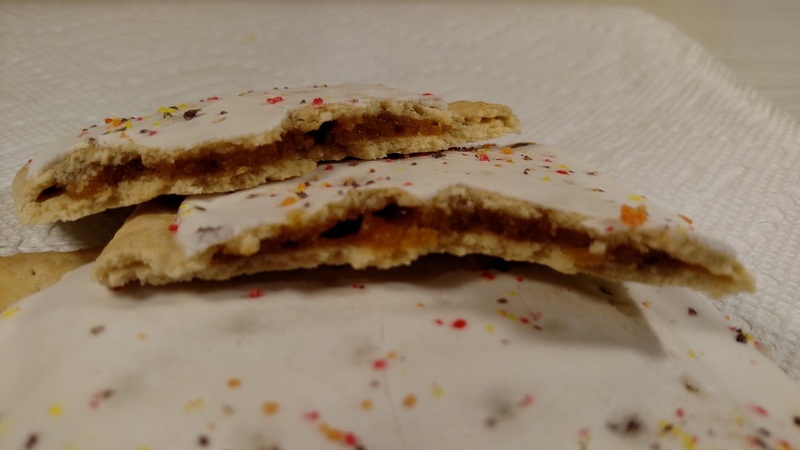 Pumpkin pie in a Pop-Tart. Sounds good to us. There was NO hesitation from Denny or Herman; we knew this had to be done now. We drove to the grocery store to pick these up. Sadly, the Walmart Neighborhood Market by us didn’t have them. Dammit! So, off to Kroger we went. First of all, we have to tell you that Herman doesn’t really eat Pop-Tarts. He did when he was a kid. Not so much anymore. Denny eats them all the time though. His favorite are the chocolate ones. And he eats them at room temperature most of the time. Don’t ask. So, Denny was probably more eager to eat these than Herman. 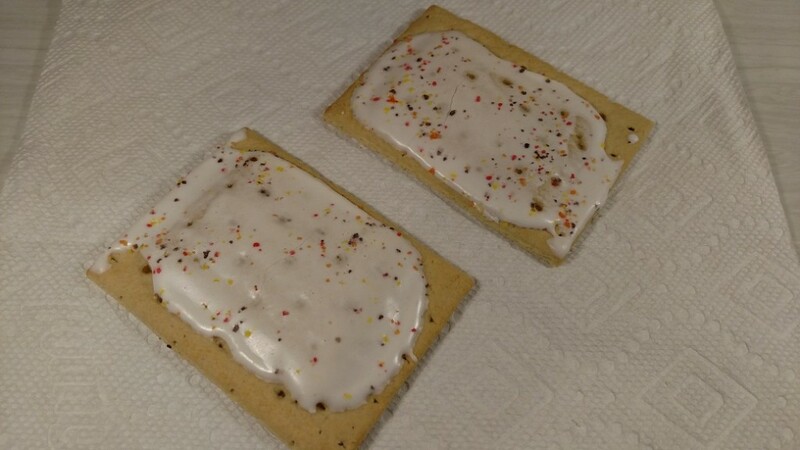 They look like standard Pop-Tarts. There is a white frosting on top of them. In fact, the box actually calls these “Frosted Pumpkin Pie.” The frosting isn’t exactly evenly distributed, as you can see. But what the hell, they are Pop-Tarts. If you expect more, you are looking in the wrong place. Notice the specs on the frosting. We kind of wondered if they would be like a pumpkin spice of some kind. Nope. They are just colored sprinkles. They make the Pop-Tart look pretty, anyway. The box gives instructions for toasting and for microwaving. It seems to us that toasting is the preferred method, so we went with that. Microwaving a Pop-Tart? Nah. That said, they were nice and warm. Nice. You can see the filling in the picture above. 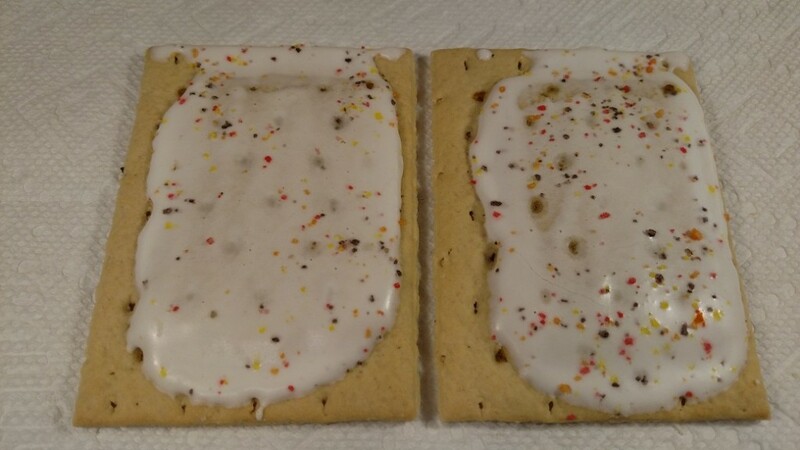 They aren’t exactly loaded with filling, but they are no different than regular Pop-Tarts. We can’t complain. OK. We gave them a try. We didn’t really know what to expect with these. This isn’t monumental, people. They are Pop-Tarts. BUT, we were concerned that they would be sicky sweet, kind of like a candy or a dessert. We can happily say this was not the case. These Pop-Tarts are NOT overly sweet. The frosting tastes like regular icing; it has a nice flavor. It is not overpowering. It is not too sweet. The sprinkles don’t seem to have any flavor at all. They are just there to make the Pop-Tarts look nice. 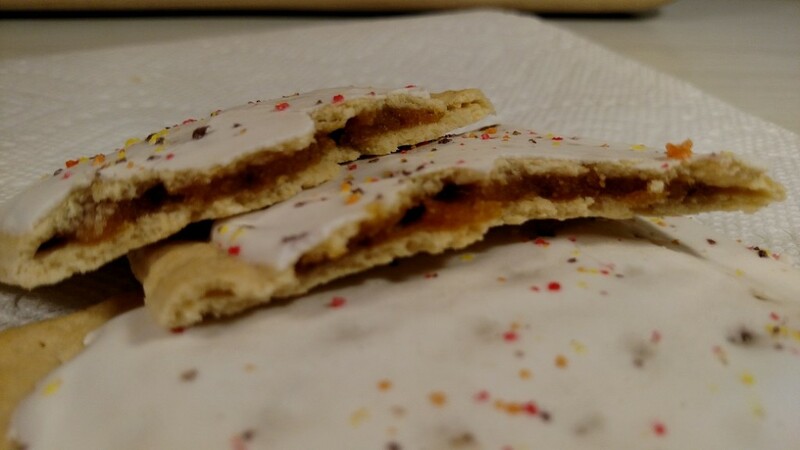 There is a nice crusty flavor and consistency to these, just like regular Pop-Tarts. Nothing much to reveal here. Now, on to the main point. The pumpkin filling flavor is subtle. That’s the best way we can describe it. It is not very strong at all. Herman doesn’t really taste much pumpkin at all. Denny tastes pumpkin but does think it is very light. 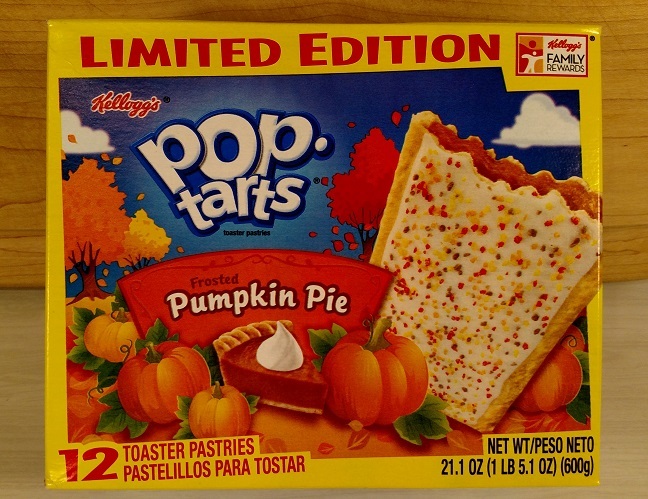 Both Snobs agree that the Pop-Tarts would be better if there was a stronger pumpkin flavor. Overall, we don’t really necessarily think these taste like pumpkin pie. The pumpkin flavor is too weak. Recall that we mentioned that these are described by Kellogg’s as, “Frosted and sprinkled, and filled with pumpkin pie-flavored filling, real nutmeg, cinnamon and clove.” We don’t taste nutmeg, cinnamon, or clove. Again, the pumpkin spices are extremely subtle. In fact, they are almost non-existent. But here is the strange part; we like them! The flavor is good, even if they don’t have a strong pumpkin flavor. Strange. We are kind of baffled on this one, people. We think these are good. We would buy them again. We just wish there was a little bit more pumpkin flavor. A box of 12 set us back $2.99. They were on sale. 12 Pop-Tarts for 3 bucks is a good deal, people. The value is there. These would be good for breakfast, as well as a snack anytime. We recommend you go out and give these a try. Keep in mind that these are marked as “Limited Edition.” So, try them now. They won’t be here forever. Admittedly, we are having trouble explaining why we like these. We want to see what YOU think. Leave comments below.